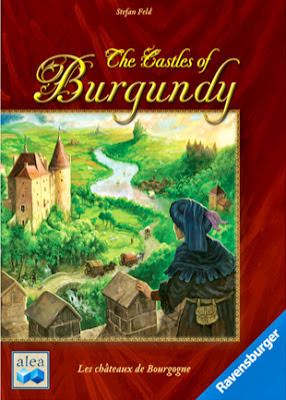 I've now played a few games of Castles of Burgundy, some 2-player and some 4-player. Here's what came of it. This is clearly a eurogame (if the big blue Ravensburger logo didn't give it away). As such, there are a few little wooden pieces and lots of worker-placement activities. Overall, players felt that the game was on the higher end of complicated, but once learned, it could be played without many rules lookups - some RPGs could learn from that. Nature's Miracle is a magic item designed for Monstrarium, but easily convertable for other systems. 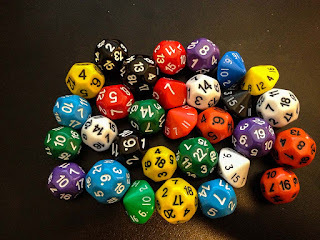 Just assume +1s is a +1 in OSR-type games, and +1d is a +4 bonus. That will be close enough. This weapon was created by an unusual blacksmith, in an adventure I'm working on. 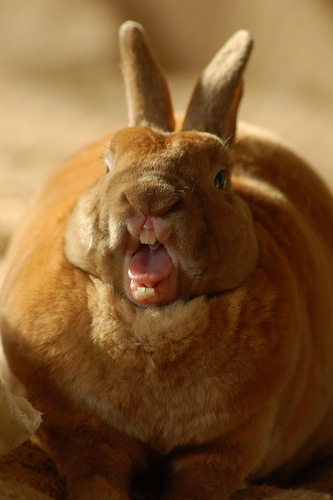 It is a well made axe, with its grip bound in rabbit fur. It smells faintly of urine, and when it damages enemies, they smell like urine, too, for 1d4 hours. This makes them a lot easier to track for characters with any form of scent-based tracking (+1d). Damage dP; +1s vs Undead; −2s vs Beasts. Of course, I couldn't just get one of each. These dice are from the Kickstarter I talked about back in August 2012. So yea, it took a while to get them, but I wasn't surprised by that. Happy to have them now! One of the first things I noticed about playing with these dice is how easy it is to get confused about which die I'm picking up. 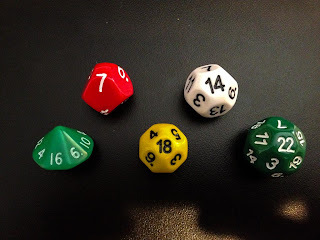 It's easy to confuse a d12 with a d14 without a second glance; likewise, d18 and d22 are easy to confuse with a d20. The d16, which previously existed (though I didn't have them in these numbers), is very easy to tell apart. The d7 is just crazy and looks like a misprinted die, but I have to say it works real well. I need to come up with some excuse to use it. Maybe it can work with my Mini Manor to cause terror in players, since it just feels so wrong. Me & Anonymous engaged in a pickup game of Risk: Godstorm this weekend. 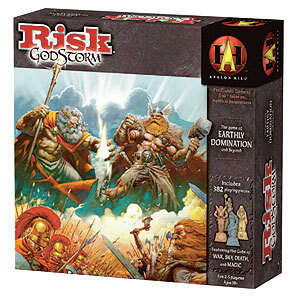 It's way better than Risk 2210. Godstorm feels like a lot more solid thought went into it - but it is still total Ameritrash gaming. You know, the sort of game where the board gets smothered with plastic pieces and careful thought gets you almost nowhere because of huge luck swings. Not that it's a bad thing to have games like that! It simply lies in opposition to Eurogames, which generally have only a small amount of luck and careful planning is well-rewarded. The game supports 2-5 players and we suspect it would be a fair bit more fun with at least 3 players, to spread out the nasty effects a little. I have a confession. I don't check my mailbox very often. In fact, I don't check it at all. BabyBat does. See, I mostly treat the mailbox like my email spam filter. If I'm expecting something, I'll check it, but otherwise all the spam can sit and rot. 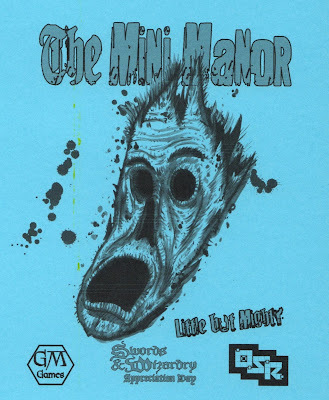 Well festering in that mess, unbeknownst to me, was a frightening Mini Manor! I can only imagine the righteous madness this inflicted on all the grocery store ads and home refinance offers that were trapped in the same, itty bitty, dark box. I already love it just for that, but what the heck, let's open it up and see what crawls out. What can I say, I'm an adventurer at heart. It starts with a tankard smashing the left side of a skull. Now, I had the same question all of you probably do. Was the attacker left-handed or right-handed? I won't give away the adventure but suffice it to say, if your fiancé's wedding dress is Lady Bolovo designed, you might want to reconsider your priorities. More horrifying than the adventure is if you take random encounter #1 and combine it with random encounter #5. Do eels like sausage?